When an ambitious and enterprising grocer said in 1847 that his aim was “to sell the best goods he could buy in shops staffed with first-class assistants,” it is not perhaps surprising that this philosophy remains at the heart of a business that has survived two wars and several recessions. 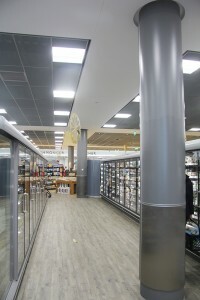 In fact, Booths has just relocated one of its stores to Poulton-le-Fylde – and the supermarket’s ethos to be the very best can be seen reflected in the selection of high quality column casings from Pendock for the interior fit-out. Internally, the décor is as pleasing to the senses as the mouth-watering Cumbrian Chicken on offer from the Hot Counter. Ordinary steel stanchions to support the roof at Booths were simply not considered to offer the right impression and the main sub-contractor – Morecambe based LN Joinery (NW) Limited – was tasked with sourcing columns that were not just functional, but as attractive to look at as its food. 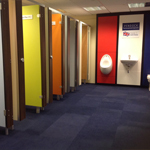 The contractor immediately turned to Pendock Limited, knowing that the specialist supplier would come up with a solution that could offer both style and substance to the new store. Pendock supplied nine column casings to surround the standard structural steel sections: three oval in appearance and the other six circular. For continuity of style, both types are clad with attractive brushed finish aluminium bonded to the plywood casings up to one metre in height, while above this a RAL 7037 Dusty Grey shade of the company’s Mouse Laminate was specified, rising to ceiling height. A 15 mm shadow gap marks the junction while ‘top hat’ feature joints with an aluminium insert rise up the full length of the casings. The 150 mm high toe and 160 mm head collars are also finished in the Dusty Grey laminate. While it was Edwin Booth that first uttered the family business’ ethos, it was his son John that took the philosophy still further: he rewarded his much-valued staff with a bonus at the turn of the century and in 1920, invited them to become shareholders. Still valuing its staff today, it seems only right that his company “has always been and always will be, a special place to work.” This principle obviously encompasses offering an attractive working environment. Pendock’s column casings are all produced to order for clients across a variety of sectors including hotels, leisure, hospital, education and retail. They are available with a very wide selection of finishes and can incorporate lighting or other services.